The bottom margin for text in the text view. Note that this property is confusingly named. In CSS terms, the value set here is padding, and it is applied in addition to the padding from the theme. Don't confuse this property with margin-bottom. Which IM (input method) module should be used for this entry. See gtk-im-context. Setting this to a non-nil value overrides the system-wide IM module setting. See the gtk-settings "gtk-im-module" property. Additional hints (beyond the "input-purpose" signal) that allow input methods to fine-tune their behaviour. The purpose of this text field. This property can be used by on-screen keyboards and other input methods to adjust their behaviour. If populate-all is true, the "populate-popup" signal is also emitted for touch popups. The top margin for text in the text view. Note that this property is confusingly named. In CSS terms, the value set here is padding, and it is applied in addition to the padding from the theme. Don't confuse this property with margin-top. 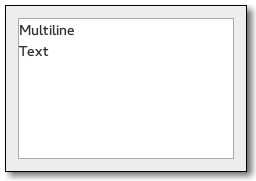 gtk-text-view has a main css node with name textview and style class .view, and subnodes for each of the border windows, and the main text area, with names border and text, respectively. The border nodes each get one of the style classes .left, .right, .top or .bottom. The "backspace" signal is a keybinding signal which gets emitted when the user asks for it. The default bindings for this signal are Backspace and Shift-Backspace. The "copy-clipboard" signal is a keybinding signal which gets emitted to copy the selection to the clipboard. The default bindings for this signal are Ctrl-c and Ctrl-Insert. The "cut-clipboard" signal is a keybinding signal which gets emitted to cut the selection to the clipboard. The default bindings for this signal are Ctrl-x and Shift-Delete. The "delete-from-cursor" signal is a keybinding signal which gets emitted when the user initiates a text deletion. If the type is :chars, GTK+ deletes the selection if there is one, otherwise it deletes the requested number of characters. The default bindings for this signal are Delete for deleting a character, Ctrl-Delete for deleting a word and Ctrl-Backspace for deleting a word backwords. The granularity of the deletion, as a gtk-delete-type. The number of type units to delete. The "extend-selection" signal is emitted when the selection needs to be extended at location. The gtk-text-view object which received the signal. The granularity of type gtk-text-extend-selection. The gtk-text-iter location where to extend the selection. The gtk-text-iter where the selection should start. The gtk-text-iter where the selection should end. The "insert-at-cursor" signal is a keybinding signal which gets emitted when the user initiates the insertion of a fixed string at the cursor. This signal has no default bindings. The granularity of the move, as a gtk-movement-step. The number of step units to move. True if the move should extend the selection. The "move-viewport" signal is a keybinding signal which can be bound to key combinations to allow the user to move the viewport, i. e. change what part of the text view is visible in a containing scrolled window. There are no default bindings for this signal. The "paste-clipboard" signal is a keybinding signal which gets emitted to paste the contents of the clipboard into the text view. The default bindings for this signal are Ctrl-v and Shift-Insert. The "populate-popup" signal gets emitted before showing the context menu of the text view. If you need to add items to the context menu, connect to this signal and append your menuitems to the menu. The text view on which the signal is emitted. The menu that is being populated. If an input method is used, the typed text will not immediately be committed to the buffer. So if you are interested in the text, connect to this signal. This signal is only emitted if the text at the given position is actually editable. The "select-all" signal is a keybinding signal which gets emitted to select or unselect the complete contents of the text view. The default bindings for this signal are Ctrl-a and Ctrl-/ for selecting and Shift-Ctrl-a and Ctrl- for unselecting. True to select, nil to unselect. The "set-anchor" signal is a keybinding signal which gets emitted when the user initiates setting the "anchor" mark. The "anchor" mark gets placed at the same position as the "insert" mark. This signal has no default bindings. The "toggle-cursor-visible signal" is a keybinding signal which gets emitted to toggle the visibility of the cursor. The default binding for this signal is F7. The "toggle-overwrite" signal is a keybinding signal which gets emitted to toggle the overwrite mode of the text view. The default bindings for this signal is Insert.